The apartment ensures that you experience immense pleasure and a feel-good atmosphere. The exclusive matching furniture stands for a way of life, harmony and elegance. Every piece of furniture and home accessory is carefully selected, and nothing has been left to chance here. A healthy indoor climate is ensured by the use of allergy-friendly materials. The compact studio apartments are perfect for a holiday for two. 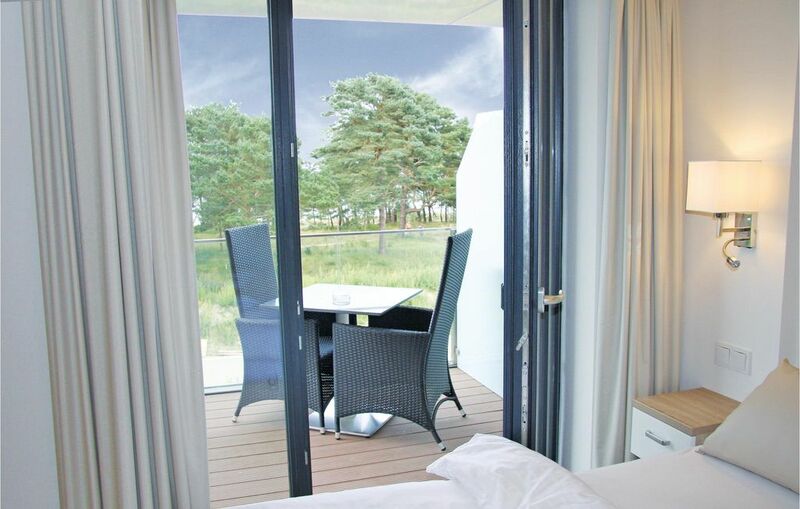 Enjoy a wonderful view of the gardens, the pine forest and the sparkling waves of the Baltic Sea from the third floor. In this 28 square metre modern apartment, you can spend a perfect holiday on the Baltic Sea. A small kitchenette is available in the house, if you are in no mood to visit the restaurants and cafes of the resort. Why not enjoy a self-prepared dinner or breakfast on the wonderful small balcony that belongs to the apartment! The large picturesque windows allow plenty of light in the bright apartment and the quality box-spring-bed ensures comfortable sleep. The quality sofa can be converted into a cosy sleeping arrangement in a few simple steps (Bed surface: 1.40 x 2.00 metres).